Dinosaur Comics - December 23rd, 2008 - awesome fun times! December 23rd, 2008: Today I changed my footer to the winter one! Now when you visit my site and scroll all the way down to the bottom you'll be reminded that it's winter. Before you used to be reminded that it was fall! I also added a link to MS Paint Adventures because it is such a great comic. I am the #1 Fan of MS Paint Adventures and you can be a fan too but you have to be the #2 Fan because I am the #1 Fan of MS Paint Adventures. CHRISTMAS: Holiday shipping deadlines have passed, but we're still shipping out awesome stuff every day! It's just there's no promises of Christmas delivery now. But there are always gift certificates! Also! New in the store and pictured above is the A Wizard Has Turned You Into A Whale hoodie that is warm and huggable and awesome, which coincidentally are properties I'm sure are also shared by the person you may want to buy it for!! One year ago today: IT SURE WOULD BE A GOOD TASK, HUH? a good task for someone with music mashup skills! 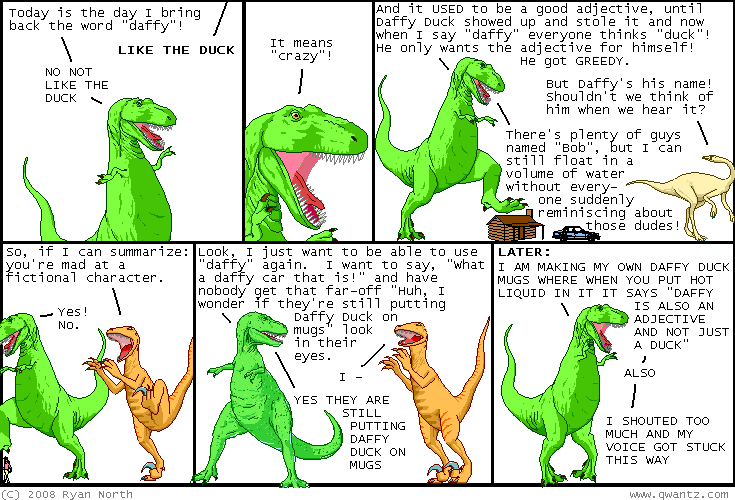 and - and who also likes dinosaur comics?